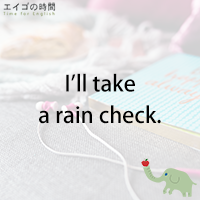 Today, I’m going to give you another “rain” idiom. It’s my favorite and I talk about it every year in June or July. So, if you’ve been with us for some time, you must be familiar with the expression “to take a rain check”. Actually, the phrase has nothing to do with rain. It’s about declining an invitation. For example, your friend says, “Would you like to join me for dinner tonight?” Unfortunately you have other plans. Then you can say, “Umm… maybe not tonight. Can I take a rain check on that?” You can also say, “I’ll take a rain check” or “Let me take a rain check”. It means you can’t accept the offer now, but want to do so some other time. Anyhow, it’s an elegant way of saying no to an invitation. It’s very useful.